"In the watch trade, anything beyond the marking of the hour, minute and second, is called a "complication." So my $80 Swatch has two complications, indicating both the day of the week and that of the month. 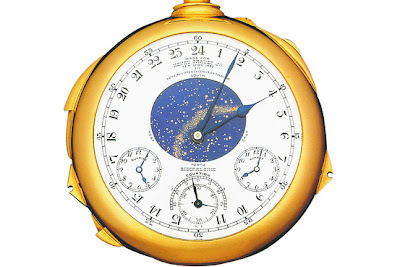 A pocket watch sold by the firm of Patek Philippe in 1933 has 24 complications, including an alarm, several sets of chimes (one of which plays the same melody as London's Big Ben), the appearance of the night sky over New York City at any given moment, moon phases, even sidereal time. No wonder it is known as the "supercomplication." Today, of course, any iPhone has far more complications (we call them apps). [...] The spine of Ms. Perman's story is a sort of informal game of horological one-upmanship between two very rich Americans, James Ward Packard and Henry Graves Jr. They never met, but their silent competition to own the world's most complex watch pushed the design of these mechanical devices nearly as far as it could go and produced some of the most stunning mechanisms ever constructed."